Below you can listen to my radio interview with Kevin Henry, the Cultural Diversity Coordinator for the City of Bellevue, Washington, USA, and talk show host for Voices of Diversity and AfraGenesis. The following interview took place on Thursday, May 17th on the AfraGenesis show on 1150AM KKNW. It was a complete honor to be contacted by Kevin Henry to do an interview on his radio program! 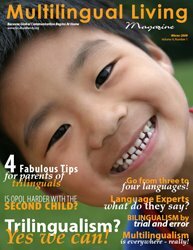 It was also a fabulous way to practice getting the word out about the Bilingual/Bicultural Family Network and Multilingual Living Magazine. I am often very nervous when speaking in public (whether in person or on a radio show). But each time I do it, the more comfortable I become. Just practice for those interviews we'll be giving for big radio stations in the future, right? HAH HAH! Thanks so much for sharing this with us. You sound very cool and collected - great radio voice!